It’s six in the morning and I hardly open an eye. It’s complete silence in the motor-home, and even in the camp site of the little village of Whakapapa. To my great despair, I’m not an early bird but today I’m determined to keep at least one eye open until my body is fit for action. In an hour, we’ll start to walk up the Tongariro Alpine Crossing, a group of volcanoes in the middle of New Zealand’s Northern Island. Before arriving at the starting point, we always dream of an intimate walk with the mountain, with some fresh air and the very first sunrays coming out. But then, as we arrive, we end up by doing the same as a hundred people who had the same idea that day; we start walking up in line, exhaling mist at every step and with red ear tops. The sky is promising but the ultra-light down jacket is necessary in the freshness of the early morning. The sun slowly rises, ray after ray, behind the mountain. Walking against the light makes it difficult to see the landscape in front of us but the Mount Ruapehu, further up on the right, is radiant. The ascent begins softly along a wooden footbridge that preserves a fascinating flowerbed: little flowers, long and thin herbs, perennial plants of all sorts and narrow streams all surrounded by volcanic rocks. This beautiful first part of the treck helps us wake up. The valley behind us slowly takes shape. The first of the two steep ascents is a little path that is dug into brown volcanic rocks. It lets us discover step by step the beauty of the trek. As the sweat runs down our body, we are more and more impatient to see the end of it. When we finally get to the top, still dizzy by the effort, we are suddenly face to face with a lunar landscape: here we are at Southern Crater! The path becomes straight, the landscape flat and spacious, and the ground ochre and dusty. Such a contrasting perspective is fascinating and a relief for our legs somewhat aching. The view is magical, almost unreal. I have the impression of walking on the moon. As we let our eyes circle round the edge of the crater to grasp its size, they end up on the imposing Mount Ngauruhoe on the right-hand side. It’s breathtaking! This volcano has a perfect shape and looks like a model that we used to build at primary school with its bright red top. Beautiful! Once the crater crossed, we start the second big ascent before the summit. My eyes are fixed to the ground; I’m like a kid. Rocks are yellow, orange, red, and even blue! I want to pick them all, just to check if tomorrow morning they will still have the same bright colours. Bizarrely enough, this second ascent seems much easier than the first one. I guess, our minds don’t have the time to think about the steepness of the slope with all the beauties all around. Half way, we can even see the valley on the other side! The sun is still shining; it’s a very nice moment! Once at the summit (1886 meters), we don’t know where to look first. On the right-hand side, just below us, the Red Crater stops our gaze immediately. We are stunned by its impressive dyke (crack), which seems to lead directly into the centre of the Earth. The colours of the ground range from velvet blacks to bright reds. Opposite us, the Blue Lake is perfectly round and overlooks the anthracite Central Crater. While we walk a little further, we can glimpse the three gorgeous green spots of the Emerald Lakes. The gas and smoke coming from the ground tops it all creating a special atmosphere. For practical reasons, and also on the advice of travellers met earlier, we have decided not to walk down the other side and make the whole crossing, but to walk up and down Mount Tongariro that stands on our left to get a better overview and go down on the same way we went up. The ascent to Mount Tongariro, which peaks at 1967 meters high, offers us an extraordinary panorama: down left, on the Southern Crater we crossed and Mount Ngauruhoe behind; down right, on the Central Crater, the Blue Lake further and a bit on the Emerald Lakes even further. The ground is ochre, and in some parts bright yellow. The upper we walk, the more stunning the view becomes. Once at the top, our eyes fall down on the other side towards the huge valley and its sky dotted with fleecy clouds. Here is an ideal spot to have lunch and take a short but well-deserved break. It will be soon time to go down, as the clouds will quickly hide the summits. Starting time: early in the morning (between 6 and 8 o’clock). Most of the people arrive around 7:00 am. The camp site in Whakapapa Village, located around 15 minutes driving from the starting point, enables to arrive the day before and thus to start the hike very early next morning. A sign placed just down the first steep climb warns that everyone must have the appropriate equipment: hiking shoes, a raincoat, pants, warm clothes, a hat, sunscreen, sun glasses, water (2 litres per person) and some food. The weather is changing. When we went down (at around 1pm), the sky became overcast and the tops of the mountains were in the clouds. The Crossing: from Mangatepopo car park to Ketetahi car park. A shuttle links the two places for around 30 NZD (reservation needed). Back and forth (what we did): from Mangatepopo car park to the Tongariro Alpine Crossing summit, then go down by the same way. Mount Tongariro: from the Tongariro Alpine Crossing summit, walk up and down the Mount Tongariro (it takes 2 hours back and forth). 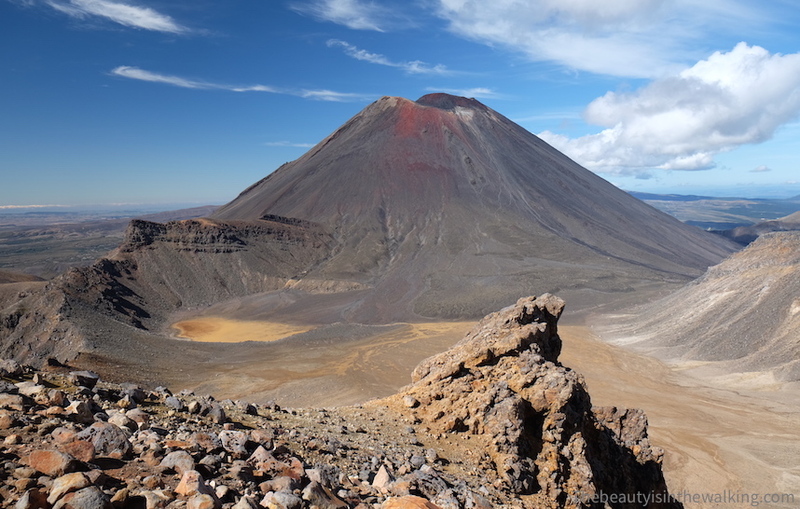 If you choose to do the whole Crossing, you may not have enough time to go up and down Mount Tongariro (unless you’re very quick and athletic!). So be careful to check the time! That’s one of the most beautiful treks we ever did. And you? What are the treks you enjoyed the most?